If you think about all the content available on the web, you can see that to stand out you have to do more than just do what you do well. You have to take up digital space. You have to build credibility by having other people talk about you. You have to be available on multiple platforms to connect with your audience. A website acts as the center of all these other reference points. You have the greatest control over content on your website so getting potential clients to your website is key in ensuring the greatest control of messages you are sending with your unique brand identity. 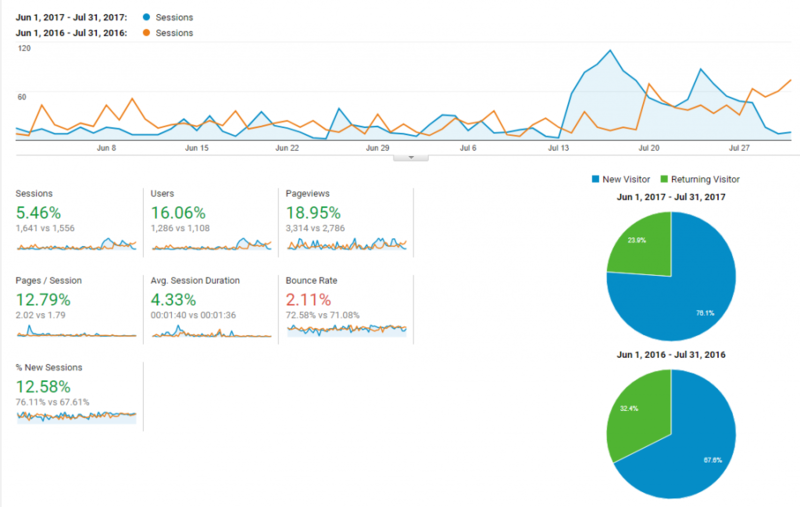 About 6 months ago one of our clients came to us looking to build their digital presence. 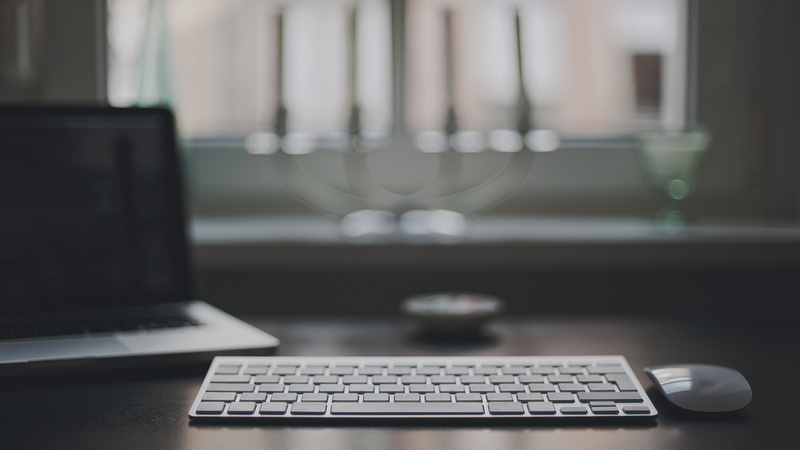 We started with a keyword strategy and shaped social media content, website copy and SEO elements around that strategy. An 8% increase from social media shows our clients following is growing, they are engaging with the brand and are ready to take the next step. 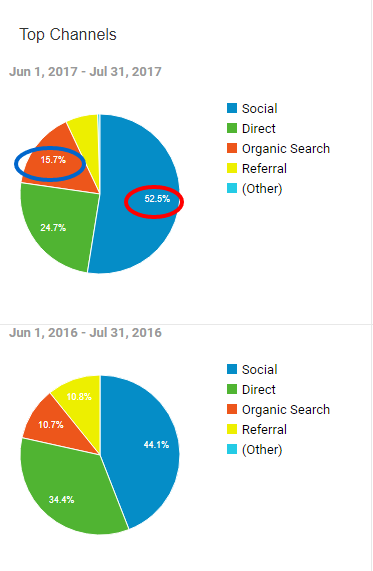 Comparing Google Analytics on acquisition for June & July 2016 with June & July 2017 showed that more people are coming to the website via social media and organic search. An 8% increase in traffic from social media shows that our clients following is growing and that they are engaging with the brand and are ready to take the next step. The design of your site, the pages you include, the text on the pages, the images of your team, all these things send a message about your brand values and the products and services you offer. The unique personality of your brand is communicated through all of the visual and editorial content you and your team put online. It can feel intimidating to build your footprint with all the effort required to develop your personal brand. It takes time and that’s part of the reason many people get a licensed to operate under an established brand group and give up some of their commission (Check out the recent REB poll). professional photos, and a website your control. Establish your brand values and mission statement. Develop copy about who you are as an individual, a professional, and a service provider. Then spread that copy consistently across every relevant platform you can find. Although it takes time and effort, establishing you digital footprint means less chasing and more educated, intentional leads. Posted in Agent Tips & Rescouces, News, Tech & Innovation for Digital Agents on 2 Aug, 2017 by Ryan O'Grady. « Previous: What SEO items are included the purchase price of a website?